"This delicious drink is a great de-stressor for those hectic holidays!" 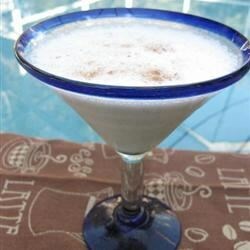 In the container of a blender, combine the brandy, creme de cacao, milk and ice cream. Process until smooth. Serve in glasses topped with whipped cream and a dash of cinnamon. Creme de cacao, chocolate syrup and ice cream make a super-rich cocktail. The recipe is good, but I added more brandy and creme de cacao. I put in the correct amount of milk, but it made it too liquidy for our taste. I would cut the milk amount in half. I found this recipe rather tasty! I do think a little more brandy was needed. With bump up on the alcohols. Yummy luscious. Can I have another? Yum, yum and yum! It tastes so good, there is a tendency to forget alcohol is involved. I'll certainly be making this again!